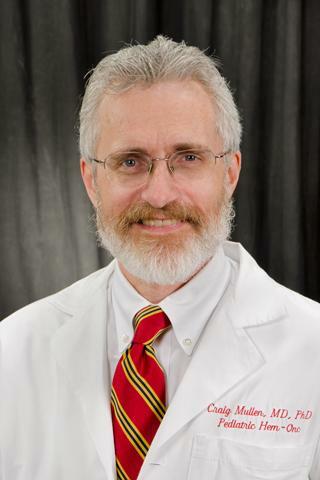 Craig A. Mullen, M.D., Ph.D.
Dr. Mullen serves as the Chief of the Pediatric Hematology / Oncology Division. He is also the Director the Fellowship Program. He has joint appointments as Professor in both the Department of Microbiology and Immunology and Professor in the Department of Oncology. Dr. Mullen current research work examines the bone marrow microenvironment of acute lymphoblastic leukemia. The current goal of the work is to identify the molecular mechanisms by which nonmalignant cells in the marrow microenvironment that provide antiapoptotic support for leukemia cells. Ultimately this may identify new "drug-able" targets that may improve leukemia therapy. Pahl, K.; Mullen, C.A. "Acute chest syndrome in sickle cell disease: Effect of genotype and asthma". Experimental Biology and Medicine. 2016; 241(7): 745-748. Chen, J.; Mullen, C.A. "Patterns of diagnosis and misdiagnosis in pediatric cancer and relationship to survival". Journal of Pediatric Hematology and Oncology. 2016; 39: e110-e115.